In order to resolve employment relationship problems under s 149 of the Employment Relations Act 2000 at the request of the parties a mediator from the Ministry of Business, Innovation and Employment can certify agreed terms of a Settlement Agreement. In this way, Settlement Agreements offer employers and employees the opportunity to bring finality and closure to an employment relationship problem. This can be arranged without a formal Mediation of the Ministry of Business, Innovation and Employment taking place. What usually occurs following the establishment of an employment relationship problem is that there are settlement negotiations made on a 'without prejudice' basis in order to preserve the positions of both parties and to ensure the negotiations are confidential. This will be followed by the signing of a Settlement Agreement by the parties. The Settlement Agreement will then be given to a mediator from the Ministry of Business, Innovation and Employment who will explain the effect of certifying to the parties. This means the Settlement Agreement will be treated as full and final, binding and cannot be brought before the Employment Relations Authority or Employment Court except to enforce the terms and conditions of that Settlement Agreement. 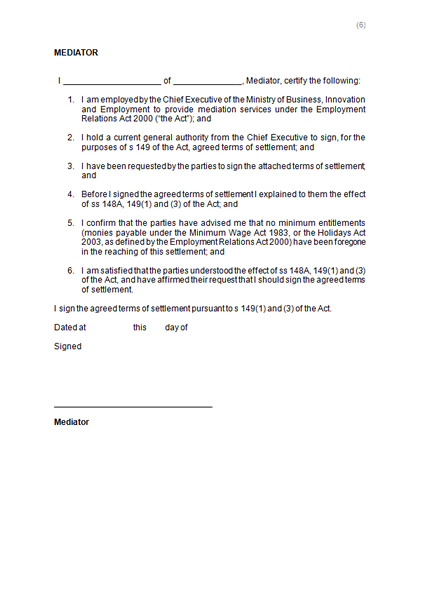 Where a Settlement Agreement is orally agreed or signed but not certified by Mediator from the Ministry of Business, Innovation and Employment, the Settlement Agreement may still be binding under the rules of accord and satisfaction but it all depends on the wording of the Settlement Agreement. An oral agreement may not be binding and enforceable. 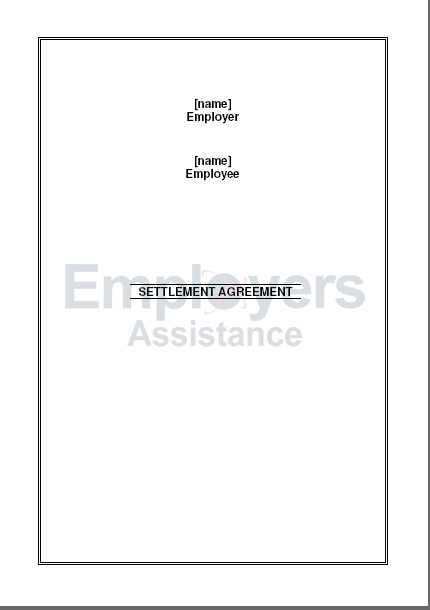 Employers Assistance has two different types of Settlement Agreements. The short form Settlement Agreement is for the majority of employees. It provides for full and final settlement of all claims that the employee may have against the employer. There are also clauses relating to the return of property and confidentiality of the fact of a Settlement Agreement. The long form Settlement Agreement is for executive, senior or managerial employees who need to be explicitly bound to post-employment obligations with clauses relating to a restraint of trade, non-solicitation, confidential information, and intellectual property. If there is a consideration involving money a strong incentive for the employee is that such money can be 'tax free' if paid and accepted under s 123(1)(i) of the Employment Relations Act 2000. Such payments can usually not exceed guided limits set by the IRD. Settlement Agreements provide a degree of certainty to employees and employers. They can avoid the possibility of being unsuccessful in claims before the Employment Relations Authority and Employment Court where the employee or employer may be required to contribute towards legal costs. Settlement Agreements avoid the endless delays, stress, and publicity involved in the matter proceeding to the employment institutions. Under the Employment Relations Act 2000, there are penalties for the breach of Settlement Agreements which can be useful where the terms of the Settlement Agreement are not being adhered such as a failure to return property or failure to pay money. Employers Assistance's Settlement Agreements put the employers in the best position to avoid such problems.